What is the Adopt - a - River Program? Don't be a stranger! Now is your chance to step up, join fellow anglers, and give back a little to our fishery and support a great fishery for the next generation. 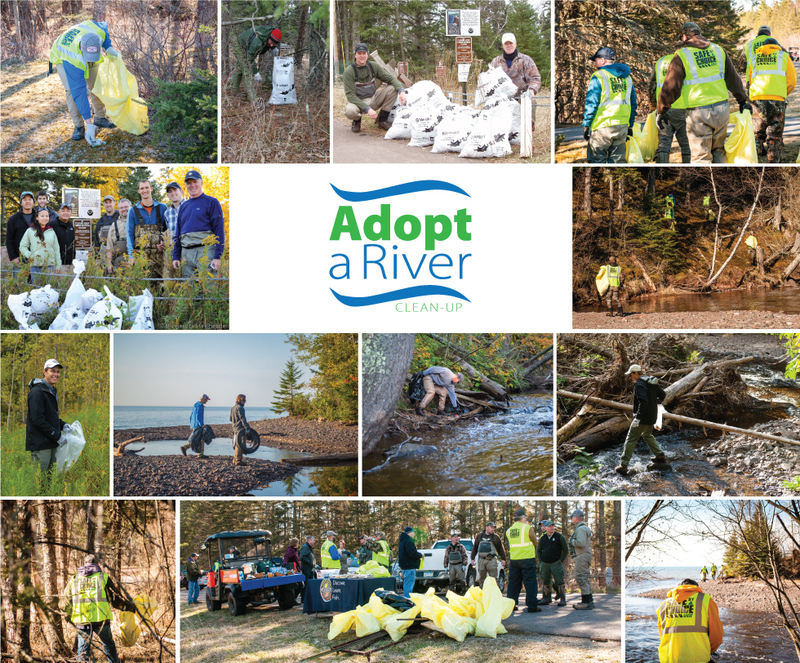 Our Adopt-a-River clean-up is open to any and all like-minded anglers (and non-anglers too) who are looking to volunteer some time to give back a little to our North Shore fishery. You are not required to sign up. However, to help us better facilitate the event, sending us an email notice is requested. Bring a friend! The river accessibility element on the other hand varies dramatically along the North Shore and deserved a close look. We have a diverse group of friends and volunteers at MS, from young teenagers to veteran anglers in their 70's. Selecting a river that requires some major hiking or wadding in tough conditions could dramatically limit the amount of volunteers able to assist for stream-side clean-up. The distance up the shore is also a factor. With the majority of anglers steelhead fishing south of Grand Marais, it is questionable whether we will have an adequate volunteer staff willing to make the journey for a clean-up day in the upper shore area. Finally we have the trash/pollution element. This is obviously the biggest factor in our decision. Our Field Staffers referred to years of mental notes as to what river consistently has had an issue with trash along trails, river, parking area etc. We also looked at which river would also get a fair amount of tourist pressure throughout the year. We all know that the trash issue is not just from careless anglers, tourist play a role in this as well. After a collective review we decided the river needing some extra TLC was the Sucker River. The Sucker fits all 3 of our criteria. The proximity is convenient for the majority and the accessibility is not too difficult even under tough conditions. The habitat is good and the Steelhead population is healthy and growing. So, we moved forward with the DNR and are now the official Adopt-a-River sponsor of the Sucker River. The section we committed to is from Lake Superior inland upstream about a mile. We focus extra awareness in our clean-up efforts in the lower reaches of the river that receive the most fishing and tourist pressure. We plan at least 1 clean-up outing annually. 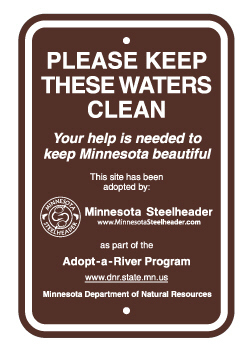 In the winter of 2010, we had a poll on our news & reports page asking for your feedback on which river would be a good fit for Minnesota Steelheader (MS) to Adopt through the MN DNR Adopt-a-River program. A big thanks to all of you who took the time to vote and/or contact us with your comments and opinions. After collecting the data, we received a tie with the two highest votes gong to the Sucker River and the Devil Track River. The Baptism River was a close second. Through the course of the poll we received a variety of comments and opinions as to which river would be the best fit for us. We received feedback from interest in helping rivers from the Lester River all the way up to the Flute Reed River- a pretty impressive span. Reiterating what we stated in our poll, our selection process needed to focus on a few key elements: level of visible trash/pollution, accessibility for a diverse group of volunteers, and overall steelhead habitat. All the rivers that were in the poll have the steelhead habitat so that pretty much cancels itself off as a primary focal point.